Choosing rewards is the best part about Swagbucks and can be so much fun! The Rewards section is where you can spend your hard earned digital points called SB on gift cards. One of my favorite prizes is the $5 Amazon gift card since you can save them over time and use them all at once on Amazon.com, plus the $5 gift cards are generally available at a discount. 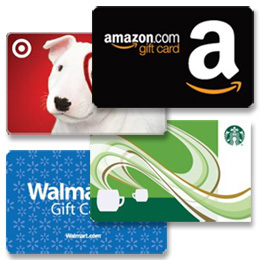 Swagbucks has a large variety of gift cards that you can choose from including Paypal, Walmart, Amazon, iTunes, Target, Papa John’s Pizza, Kohls, Game Stop, Delta, Uber, and countless others that are essentially free! Once you find the prize you want, press the “Redeem” button. You will be asked confirm and submit the order. Once you click submit , you will have to verify the order. You can do this two different ways. You can either answer your security question, or click the confirm button in the email that Swagbucks send when ordering your gift card. After that, your free gift card for Swagbucks should arrive in a few days. If you’re feeling generous, you can also donate your SB to various non-profits under the “Do Good” section. Generally, every SB donated is the equivalent of $0.01, so 1,000 SB is equal to $10. Another way to win prizes and free gift cards is by entering Swagstakes (Swagbucks Sweepstakes). The upside is that entering Swagstakes is that it costs a lot less than if you spent your SB on the prize. Some of the Swagstakes you even get a discount if you buy multiple entries. The downside is that there is no guarantee that you will get the prize. Some Swagstakes are limited time entry, while other ones have limited spots. If you have a few extra SB to spend, or feel like taking a risk, you might just get lucky and save yourself a lot of SB and win more SB, prizes, or a gift card.